This Paper Planetarium is a unique, easy Space craft for Preschoolers on up. Hang it in a window and the glitter glue stars will sparkle! 1. Cut out circles in different sizes and different colors. 2. Cut a piece of wax paper about 12" long (make it longer if you'll be framing it with a paper bigger than the standard 81/2" X 11"). 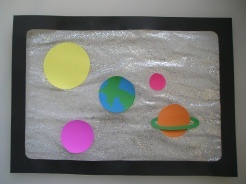 With a large paint brush, paint on glitter glue all over the wax paper and then place your planets on top of the glue. 3. Cut a frame from a black piece of construction paper (standard 81/2" X 11"). The border in the picture is 1" thick. Place on top of the wax paper to frame your solar system, and trim around the edge.